One of my good friends is from a Gujarati family, and though she has spent her life in Kuwait, Bombay and the US, she is very well versed with Gujarati culture, language and cuisine. She always used to tell me about the amazing Gujarati food that her Mom used to make in Kuwait while she was growing up. Then, last summer, when her mother was visiting Chicago, I took this opportunity to learn some recipes from her that I have always loved in Gujarati food. Pallavi Aunty was very kind and so lovingly taught me how to make Patra and Sooji Dhokla. 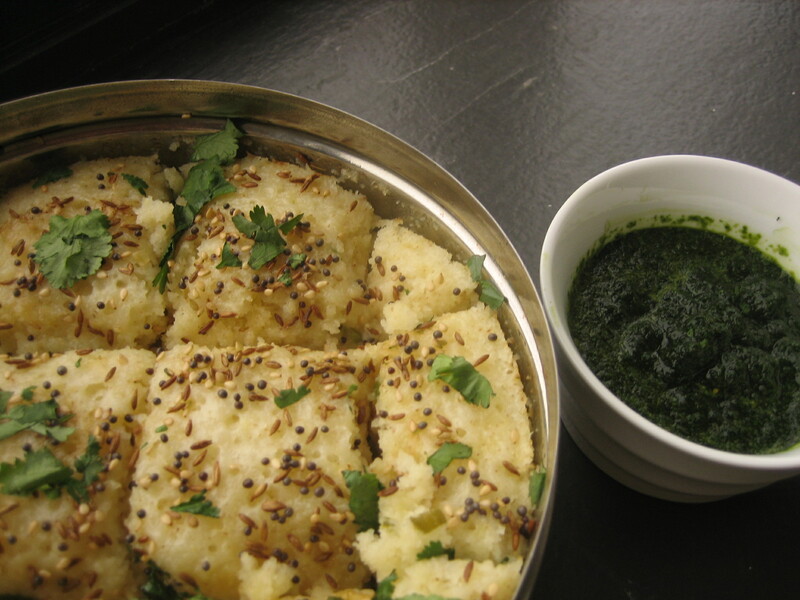 Patra recipe is for another day, but today I am going to tell you how to make the best sooji dhokla in the world. Making dhokla, is somewhat like baking, in the sense that you are not able to taste and check and tweak it along the away. So once the batter is steaming, the fate of the dhokla has already been decided. Hence it is important that the proportions be exactly maintained or the final product might not turn out to be exactly as you had hoped. After this point, the ingredients are to taste and are not precise measurements. Feel free to increase or decrease quantities. Soak sooji and dahi for 2 – 3 hours. I sometimes soak it overnight in the refrigerator, but 1 hour is the absolute minimum. Mix oil, salt, besan, sugar, lemon juice, grated ginger and minced green chillies into the sooji batter and mix well. Boil water in a broad vessel. Grease a steel thali (or a cake pan) that will fit inside the vessel and set it on a stand in the vessel. This is our apparatus for steaming the dhokla. At this point, you need to work rather swiftly. Put the eno powder in the batter and mix with hand. It will start bubbling and we want to capture this effervescence. Pour the batter into the thali and cover the vessel. I like to wrap the cover with cloth so that the steam will not fall back into the dhokla as water droplets. I also keep a weight on top of some kind to create a better steamer. That is optional though and if your cover is heavy enough, you may not even need it. Steam it on high for 15 minutes. Do not check in the middle as that will make the steam escape. When the dhokla is about to be done, you can prepare your tempering. Heat some oil and put the rayi, jeera, til and curry leaves in it till they pop and start to smell fragrant. Once the dhokla is done, spread the tempering on the thali and put some fresh chopped cilantro leaves on top. Serve with green chutney made with dhaniya, ginger and green chillies. When I first came to the United States as a grad student, my university paired me with a host family who had generously volunteered to help and orient a new foreign student in their city. The Taubes were a wonderful family and I enjoyed learning about the American life through them. It was at my host family’s place that I had eggplant rollups for the first time. Till then I had only had eggplant, or baingan as we call it in India, in the form of the fire-roasted Bhartha, or the stir-fried Aloo-Baingan. This new dish was a revelation for me as I had never realized that our Baingan Raja could taste so sophisticated, yet earthy at the same time. I sometimes substitute the bleu cheese with goat cheese. Any soft cheese with a strong flavor will do. 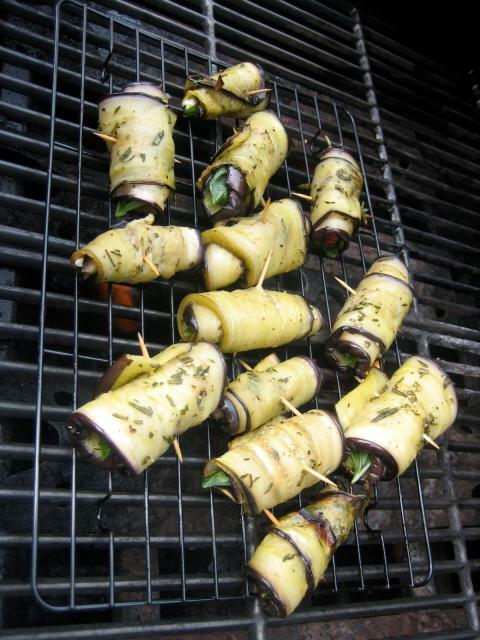 Also remember to season the eggplant with salt and black pepper before broiling it.